Spring and summer bring flower’s flavors and fragrances – but how to capture them, for great taste and healing? 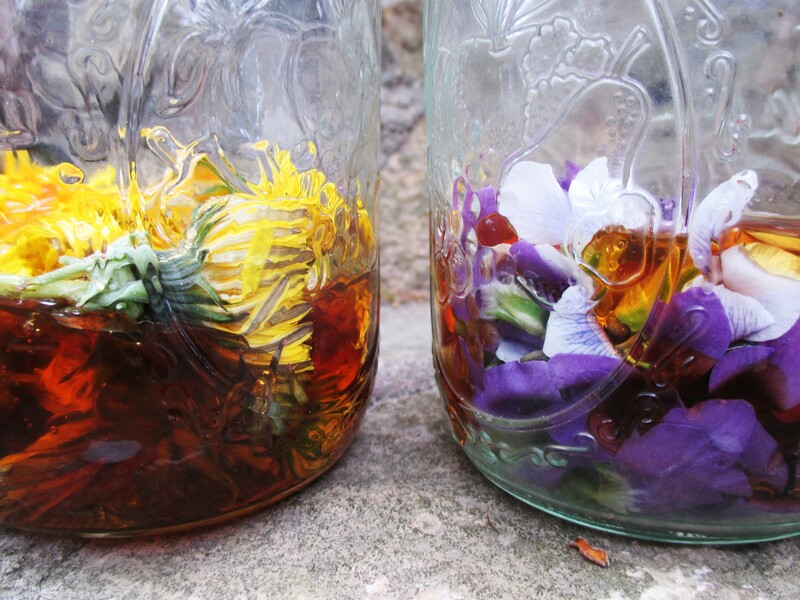 Learn how to make an herbalist’s floral simple syrup recipe. It’s that sweet cusp between late spring and early summer. 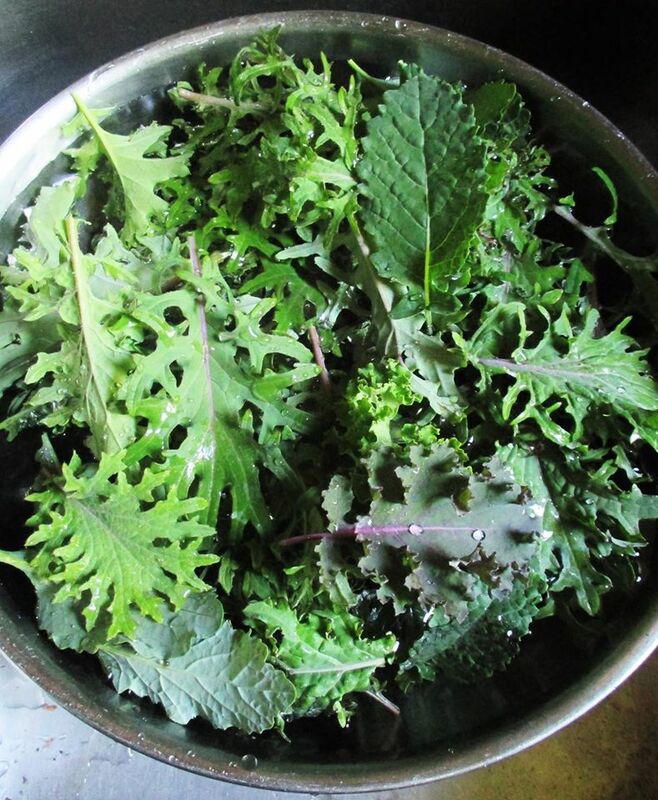 And when this season comes flying around the corner, it gets harder to keep my attentions riveted to herbal preparations, recipes, writings, experiments, and all those other plans kindled during cold, indoor winter months. It’s a busy season for growers and gardeners (as all of you out there of that ilk full well know), directing your time and energy to garden planning, seeding, soil work, watering, and maintenance. But then when I’m outside, I notice the flowers. 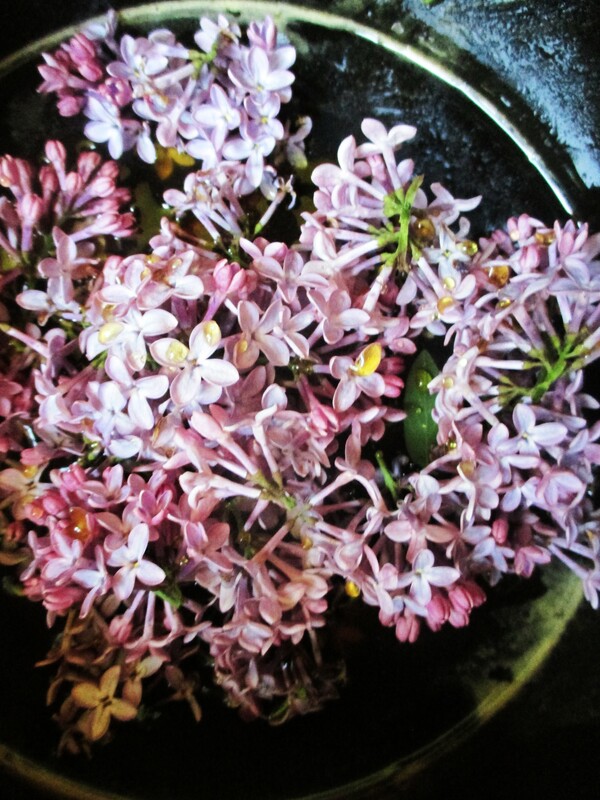 Even then, I have to drop everything I’m doing and make something with them – especially to take advantage of spring’s short window, and capture the essences of the herbalist’s favorite healing flowers: violets, dandelions, honeysuckle – even some peculiar ones too, like lilac and apple blossoms. How to best do that? The healing effects of flowers is one thing – but how can you capture that divine aroma and floral taste, too? Last spring, I tried my hands at some syrups to achieve this. Think herbal syrups for cough remedies, for which there are myriad recipes online. However, a lot of those recipes (such as for marshmallow, wild cherry bark, elderberries, etc.) require constant simmering or even hard boiling (especially for tough roots and bark) to unleash their essences and flavors. Flowers, on the other hand, do not. In fact, doing this can pretty much tarnish and destroy that delicate, fragile, perfumey-floral flavor you’re after. So what inspired me with flowers was the simple syrup: yes, the tradition of cocktails, bitters, and the roots of old herbalism. With that inspiration, I came up with a recipe that lets you hold on to these syrups for the long term, much like your typical herbal syrup. With just a flash of heat and a little water, this recipe is enough to suffuse your honey without destroying that floral, heavenly scent and flavor – just like what happens with a cocktail simple syrup. But I didn’t just stop there. I combined this method with sun-infusion (think sun tea), done beforehand as the first step, to craft what I have so far deemed the perfect recipe for capturing flower flavor. Apparently, it’s pretty easy to make, too. Syrups have long been used as famous cough, cold, flu, and fever remedies. It’s no stretch to think that herbal syrups, made by ancient herbalists, are what we have to thank as the prototype for modern-day over-the-counter cough syrups. The same goes for flowers, the dainty petals of many boasting certain healing powers over the centuries. Some of the most popular flowers among herbalist are elder flowers, violets, calendula, passionflower, bee balm, boneset, chamomile, yarrow, lavender, and many more as well. Combining the two, flowers and syrups – and thus crafting floral syrups in the delicate method later described in this recipe – can accomplish a couple things. Firstly: you’ll have a divine-tasting simple syrup to enjoy in cocktails, on pancakes, sweets, fruit salads, and much more, each evoking fragrances and memories of spring. But also: you’ll be capturing and preserving the healing benefits of some of these flowers in one of the purest ways possible, and without damaging their compounds OR their scents and flavors. To be frank, however: you probably won’t find the healing properties of some of these flowers very effective in this form, considering the amount of syrup (and sugar!) you would have to ingest to experience it. For that very reason, if you’re thinking you could make an antiviral elder flower, boneset, or honeysuckle simple syrup for example, do beware that the presence of those sugars which you must also consume to get the adequate virus-combating phytochemicals, will likely offset any small likelihood of benefit. The same goes for many other “flower powers,” too. But if there is one thing I have noticed in my own practice and experiences with flowers and hebalism? Almost all flowers are somehow cooling and damp in energetics, to varying degrees. Maybe not all herbalists have put this together, but think about it: elder, yarrow, boneset, and violets are used for cooling fevers. Bee balm (Monarda) and calendula are notoriously cooling for other issues, too – while passionflower and lavender, cooling in the same way, also bring that influence to the mind and the nerves. If I were to recommend an herbalists’ practical usage of a floral simple syrup for anything (or to the layperson as a home remedy), it would be anything from overheating, heat exhaustion, and fevers. I have seen a couple tablespoons, added to a piping hot cup of water, promote a cooling and relieving sweat within 10 minutes time. On the other hand, their addition to midday chilled cocktails and mocktails (or maybe even an electrolyte solution) could help take the edge off an intensely hot day – especially fir those with hot and fiery liver-strong constitutions! -Pick your chosen flowers (about 1 pint), and place them in your jar. The best times to pick flowers are midday on a sunny day – when flowers are fully open, at their most potent, and won’t have much excess water or dew collected on them. An excellent guide on picking and drying flowers can be found here a this Organic Life. *Remember to please pick responsibly! Harvest 1/3 of available flowers within one area – and let the remaining be, so they can repopulate for next spring. -Once you have your flowers picked, pour honey over them until they are completely covered. Take a spoon or other utensil, and use it to push the flowers down into the honey as much as possible – this both bruises the flowers to help them release their fragrances, while discouraging mold and bacteria. -Take your jar and place it in a bright, sunny spot for a full day (or two), such as a windowsill. Like a sun tea, this will give your syrup its first warm infusion of flower flavors. -Once the sun-infusion is over, pour the honey through a strainer, and strain out the flowers – compost them or throw them away. You’ll notice that the syrup is a bit “thinner” – that’s from the natural water that has been extracted from the flowers. -Pick yourself about 1 more pint of flowers (preferably of the same species and variety, unless you want to make a combo syrup blend). -Once you have that ready to go, take the strained sun-infused syrup, place it in a saucepan (avoid cast iron – stainless steel, glass, or porcelain better), and sprinkle your new pint of fresh flowers on top. -Before turning up the heat, add 1-2 tablespoons of water to the saucepan with your other ingredients. Then, turning up to medium-low heat, watch while steam begins to rise slowly from your future syrup! This gently wilts and infuses the flowers’ properties into both the syrup and the water – all of which will then infuse fully into the honey, once most of the water has evaporated away. Feel free to stir occasionally. An important note: your syrup should not boil! This can interfere with both the properties and flavor of your simple syrup. If your syrup does start to froth and bubble in the pan, take it off the heat immediately, and let it cool while stirring. -As you wait for the syrup to cool, check its consistency with a metal spoon. If it remains watery, throw it back on the stove on low heat to let a bit more water gently evaporate away. You’ll want the syrup to run slow, taking its time to drip away from the spoon. -If you’re satisfied with the consistency, let it cool down completely. Strain the remaining flowers from the syrup, bottle it, and store it in the fridge for the best perishability! I hope you try out this recipe – an herbalist’s true labor of love with edible flowers – and come up with some magnificent simple syrups of your own. And do please feel free to share your own experiences, past or present, with flower syrups (or flowers in herbalism, in general) in the comments below! Thank you for reading.